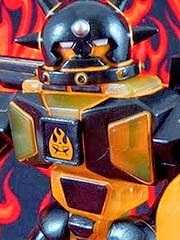 TheGodBeast has confirmed new Kabuto Mushi figures are on tap for August. The first colorway seems to be a return of the sea glass green "Voss" previously used to great effect over at Onell Design. No date (or full menu) has been given, but these figures are typically quite nice and worth your attention if you don't yet have any. More as we have it! It's yellow! The Mordles EGD Vinyl Figure is another jumbo vinyl release - yes, another one - and it really doesn't offer much new other than a creative deco. Which, let me tell you, was enough. I love these jumbo guys and the Pac-Man-esque figure goes great with the clear blue "ghost" Electra-Geists (sold separately). A few years ago I was kicking around a similar idea for Crayboth figures in ghost colors and a Syclodoc with yellow Pac-Man-esque helmet deco... but this is better. It's great, I love it, and I'm glad they did it. 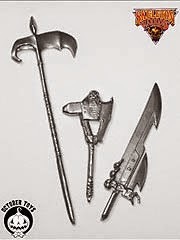 October Toys' pewter Skeleton Warriors Metal Weapons 3 Pack was sold at Comic-Con for $20 (I got one!) and now you can get one at the October Toys shop, along with their exclusive OMFG. The Skeleton Warriors Glyos-compatible figures themselves should be out around the end of the calendar year. Big Pink Crayboth! The massive, chunky Super Crayboth (in two flavors) was the highlight of tonight's drop. Click here to see the July 27 2014 Onell Design drop menu. A whopping eight normal "flavors" and two giant ones were put out for you Crayboth fans, plus some Axis Joints, regular figures, and some games. Surprisingly, there was no Armorvor tonight for the first time in quite some time. Click here to order what's left! Got $20? Go to booth #4951 to get your very own metal Skeleton Warriors weapons and new OMFG figures! Click here to see October Toys' many offerings. In a post called "DISGUISE," there's a new ToyFinity announcement! 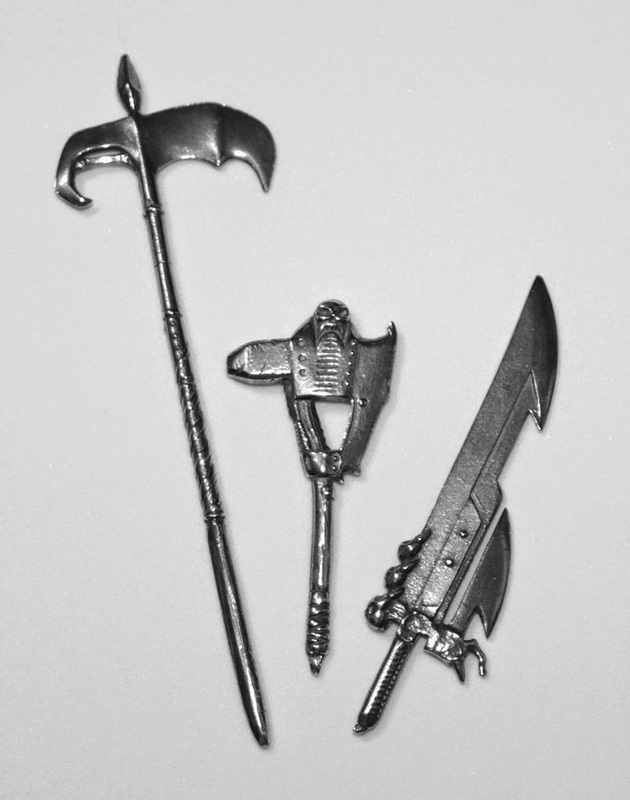 More teases have been showing up on the ToyFinity Blog all day, so just go read it. Friday! 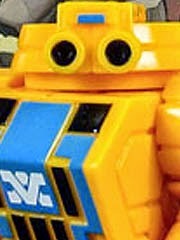 No details yet, but ToyFinity confirmed New RoboForce figures Friday 7/18. Time and figures TBD, but hey - good times! If you're a club member, Club Mordle is live! 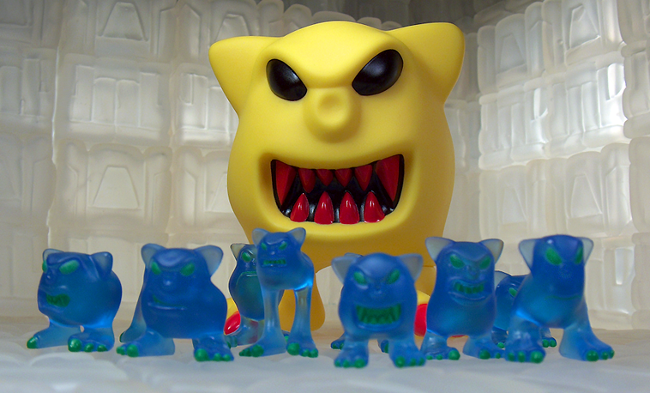 The EGD Jumbo Mordle (Yellow, Pac-Man esque) is joined by the Electra-Geist ten pack of clear blue figures, Ardaan's Mist (clear colorless with green eyes), and a couple of bonuses I dare not spoil in this post. You have until Tuesday, July 15 to place your order as a club member. We were also informed club packets are due in September or October, so there's that to look forward to. I do not have a non-club drop date yet, but odds are it'll be after July 15. I'm excited! Check it out! New Weaponeers of Monkaa hit July 9 at 12:00 PM Pacific time. 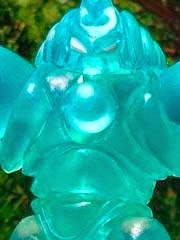 Click here to see Fyreball (pictured), DX Ehmber, the Lava Strike Force figure, and the remaining stock of the Magma Gohlem. 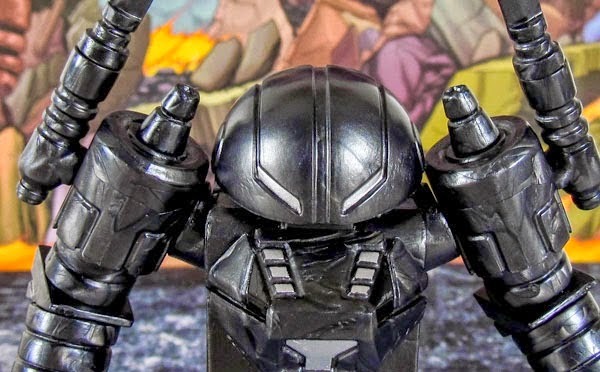 You might recall these swell orange and black figures being shown last July at Comic-Con in San Diego, but now's your chance to actually get them! Click here for their menu. If you love metallic blue, the Neo Sincroid Gendrone Legion is worth tracking down. Onell Design has been high on the blue as of late, and what better figure for today than a blue figure with some white and red? The little guy is pretty much what you're used to, except the marketing is a little different - generally this mold is sold as a Glyan, and as a Neo Sincroid he dons the silver-faced head with red eyes by default. Despite being a mechanoid of some sort, this actually makes him look more human. Or at the very least, Tin Man-esque.